We’ve been keeping our eyes glued to the latest livestream from Apple’s highly-anticipated iPad event so you don’t have to. The biggest announcement was the unveiling of the iPad Air 2, and we’ve summarised the top specs and features of Apple’s latest tablet below. What do you think of it? Let us know in the comments below. The iPad Air 2 looks very similar to its predecessor, the Air, with bezels on the sides and ever-so-slightly larger ones at the bottom and the top of the device. Although the iPad Air was applauded for being super thin, the Air 2 is actually 18% thinner at only 6.1mm, and half the thickness of the original iPad. And you know what this all means? 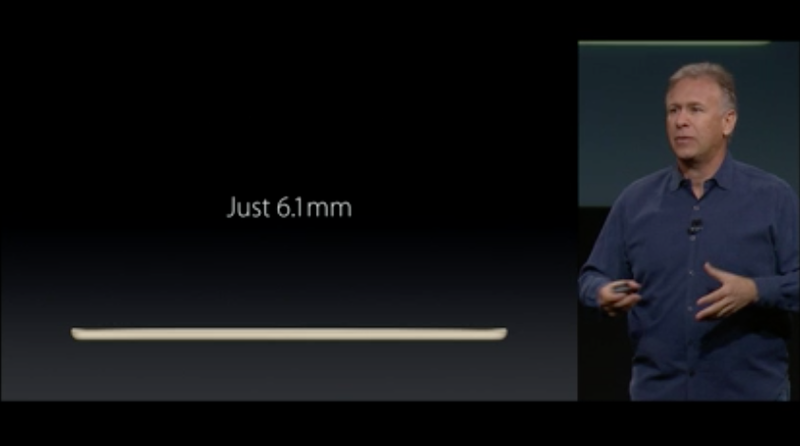 The iPad Air 2 is officially the world’s thinnest tablet (well, for now at least). The team managed to scrape so much off the size by fusing together the main chassis and the screen, which gets rid of a bit of air that was there before. There’s also an anti-reflective coating on the screen of Apple’s latest tablet, which we imagine will be really appealing to those who love their kindles – less glare for book worms. Yep, we know people look kinda ridiculous when they take photos with their iPads, but the iPad Air 2 boasts a much-improved iSight camera. It’s an 8 megapixel snapper with 1.12 micron pixels, f/2.4 aperture and it can take 1080p HD video, too. This makes it much better than anything we’ve ever seen on an iPad before – it’s a similar quality to what you’d expect from the latest iPhones, in fact it’s pretty much the same iSight camera in the iPhone 6. There was a lot of ‘for the first time on iPad’ features discussed during the livestream when it came to the device’s camera. The ones that excited us the most were: for the first time you can take 43 megapixel panoramic photos, take burst photos, take time-lapse videos and take slow motion videos, all for the first time on any iPad. Oh and the front-facing camera has also had an upgrade. And we all know what that means: BETTER SELFIES. Yep, the rumours were true. The Touch ID we’re used to on the iPhone is now here for the iPad. You’ll find the sensor right under the home button, which will allow you to open up your iPad with your fingerprint and make purchases in the iTunes and Apple app store. An exciting feature when it comes to Touch ID, is it’ll work alongside Apple Pay to make shopping online easier than ever. Which, you know, is kinda awesome and terrifying at the same time. Although Phil Schiller made a point of saying this is for ONLINE shopping, which tends to suggest the iPad Air 2 won’t support the NFC payment system. 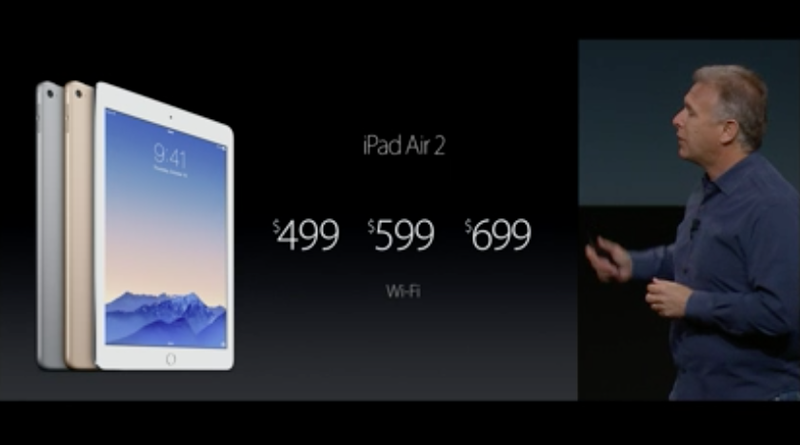 The iPad Air 2 has a new A8X chipset, which Apple claims will make graphics 180 times faster than the first iPad. Granted that was a long time ago now, but 180? Wow. It’s also 40% faster than any of its other predecessors, even the first Air. The device also has Apple’s M8 motion coprocessor, which will improve the quality of many apps and games. Take a look at the image above for all of the cost details to date. We’ve got three colours – white, grey and gold – and they all cost $499 for the 16GB, $599 for the 64GB and $699 for the 129GB. You can pre-order in the US from tomorrow (the 17th of October). We’ll get you UK prices and launch dates as soon as we find out. Unless Apple comes up with some great iPad innovation in the near future, competition from outside companies and its own product line could make iPad sales a much smaller fraction of its overall revenue stream than their current 15 to 20 percent level.